The following is a quotation from appropriate portions of the Belgian Minister of National Defense Decree Number 1034, awarding the 82nd Airborne Division and the 508th Parachute Infantry Regiment the Fourragére of 1940. 1. This elite Division which has gone with great élan through the campaigns of Tunisia , Sicily, Italy, Holland, and France, has distinguished itself particularly in the Battle of the Ardennes from December 17 to December 31, 1944. Called upon as a reinforcement by the Allied High Command in the evening of the 17th of December, at a time when the Division was in the vicinity of Reims, the Division was able to take up combat positions in the region of Werbomont only 24 hours later and this under very severe climatic conditions. Progressing towards Ambleve and the Salm, the Division opened and maintained a corridor for the elements of four American divisions which were surrounded in the vicinity of St. Vith, thus giving new courage to the engaged units. The Division had prevented the enemy from piercing the north flank of the pocket created by the offensive of von Rundstedt and thus succeeded in saving the city of Liege and its surroundings from a second occupation by the Germans. 2. After having excelled in defensive warfare at the banks of the Salm and the Ambleve and after having repelled successfully the repeated attacks of the best German shock troops, the 82d Airborne Division with the 508th Parachute Infantry attached, in spite of extreme cold and excessively deep snow, went on the offensive themselves, capturing 2500 German prisoners, including 5 battalion commanders. This fighting was extremely valorous as the organic composition of the division handicapped the unit considerably, not having at their disposal as any other infantry division would have, heavy weapons to support their attack. During 23 days, under most painful and adverse conditions, the veterans of the 82d Airborne Division did not cease to give a wonderful example of courage and heroism, exemplifying their fighting spirit by several remarkably brilliant actions. 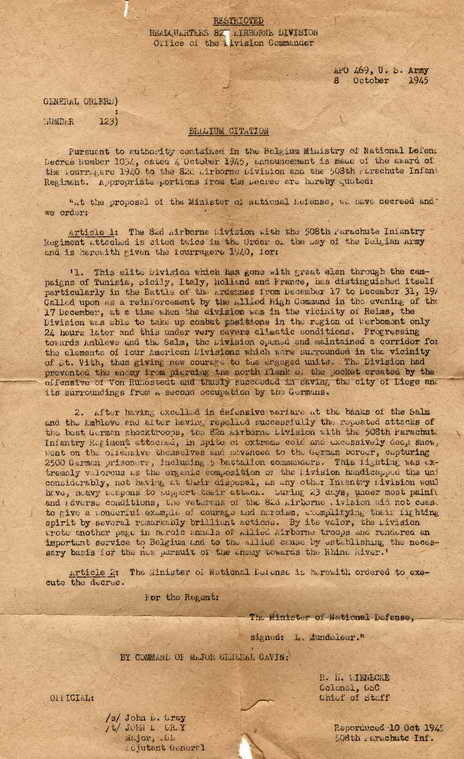 By its valor, the Division wrote another page in heroic annals of Allied Airborne troops and rendered an important service to Belgium and to the Allied cause by establishing the necessary basis for the new pursuit of the enemy towards the Rhine River. Article 2: The Minister of National Defense is herewith ordered to execute the decree. Criteria: The Belgian Fourragére may be awarded by the Belgian Government if a unit was cited twice in the order of the day. Award of the Fourragére is not automatic and requires a specific decree of the Belgian Government. The Fourragére is the same colors as the ribbon for the Croix de Guerre. A streamer (similar to the example pictured here) is displayed on the organizational flag/guidon to indicate award of the Croix de Guerre. The streamer is the same color and pattern as the ribbon for the medal. Army units may display the Croix de Guerre on ceremonial occasions by pinning it on the streamer. In addition, the Fourragére may be displayed on the guidon for ceremonial occasions as shown in Chapter 9, Army Regulation (AR) 840-10.